Do you accept medical or recreational marijuana businesses? Yes! We now can accept all CBD and THC businesses with a domestic processing partner and acquiring bank. We have stand-alone terminal solutions as well as complete POS and ERP solutions to run your CBD/Hemp or THC/Cannabis business. Check out our CBD and hemp-specific page here or our THC and cannabis-specific page here. Where do I start if I have never accepted credit cards before? So you’re new to credit card processing? Maybe you’re starting up a new business or maybe you finally decided you need to be able to accept. Either way, we can help. This puts you on par or better than national programs like Square, Stripe, and PayPal. But you can do even better with a little bit of legwork. Just like we offer a 20% savings under our Wave Program, we will also offer a 20% off of any bid you from a bank or card processor. We don’t accept cut and paste data off a website, but we guarantee 20% savings on processing fees if you get a real bid from an actual provider of merchant services. If you’re in a rush to get your account set up, go with the intro rate now and at any point in the future we will lower your rate if you provide the bid. And don’t forget our Zing Program where you can eliminate all fees by offer a cash discount to your cash-paying customers. Either way, AdvoCharge has you covered! AdvoCharge is an independent merchant service provider. Essentially we are a broker, bringing you exceptional rates on card processing through our network and relationships with several different national credit card processors. We have worked very hard to negotiate the lowest rates possible, and we pass those rates on to you. Most agents within the merchant service industry align with just one processor, and thereby offer only the products and services of that one processor. AdvoCharge, on the other hand, works with several different national card processors. While we tend to favor some processors over others, we work to determine what is the best processor for your business based on your individual business needs. We establish a direct relationship for you to the processor, but we are there as a 2nd tier line of support that you don’t get with other processing providers. You have full 24/7/365 access to the processors you are working with, but you also have AdvoCharge to contact if you are not getting the assistance you are expecting. Additionally, we can help you integrate third party solutions that benefit your business. How does AdvoCharge offer such low rates? AdvoCharge has worked tirelessly to negotiate lower and lower rates, which we pass on to our customers. We seek to develop long term relationships with our clients by offering the best rate that is locked for the life of the account, along with exemplary customer support through our processing providers. We take the approach that many, many happy, satisfied customers with outstanding rates are far better than a smaller number of clients that pay us through very high rates. As a result, we have very low attrition as few clients ever leave us once they see how much we save them! We also work to keep our overhead lean and our team small and focused. You’ll notice we don’t promote our phone number as we want the majority of incoming contact to be by email. We’ve found that we can remain even more responsive by directing incoming information requests through email, as we are able to route these requests to the right party within our organization who can answer quickly. Learn more about the Cash Discount program in greater detail on the Cash Discount Page. How do I get a hold of you? I don’t see a phone number? See the previous FAQ “How does AdvoCharge offer such low rates?” We are very quick to respond to questions or requests when you email us at save@advocharge.com. We understand that many of you want to talk to a “live person” right away, but remember you will have 800# support with your processor once your new account is established. We’re just the initial step to secure your outstanding rates which will save you thousands of dollars year after year. Hopefully using email for your initial contact is worth the savings we generate for you. Will my current processor agree to match the AdvoCharge rate structure? We have discovered that very few processors will agree to match our rate structure (or are even able to match) because our rates are below cost for the majority of processors and agents. And even if they would, wouldn’t you rather work with a processing provider that gives you a good, honest rate to begin with rather than one that when beaten down, decides to match our rates? We are sure that even if they match, they won’t beat us – no one ever has! If I’m already with a processor you work with, can you still lower my rates? We definitely can! It’s a common misunderstanding that the merchant service industry is equitable and that a given processor has just one rate that they offer to all merchants. Nothing could be further from the truth! In fact, there are dozens of processors and thousands of agents in the industry that all have the right to set the price for a given merchant as they see fit. Often times that means a wildly different rate structure for even very similar merchants. The analogy of the airlines is a good comparison to the merchant service industry: we’ve all come to expect that when we take our seat on an airplane that the price we paid is different from the price paid by the person sitting next to us or across the aisle. Things like time booked before the flight, premier status, and airline promotion all influence that price. The same is true in the merchant service industry. Replace United or Southwest with FirstData or Elavon and the same pattern arises. The processing rate you pay is largely dependent on the agent or provider you work with. Fortunately you’ve found AdvoCharge, and we have some of the very lowest rates in the entire nation, so even if you are with FirstData now, we can take you right back to FirstData, but with a major savings over what you were previously paying. What does the AdvoCharge no risk guarantee mean? We strive to not only meet, but to exceed customer expectations. If for any reason you are unhappy with the service you receive from the processor where we set up your account, you are not bound by an early termination agreement and free to cancel the processor’s contract at anytime. Unlike most processors, we’ve ensured that our clients have no cancellation or early termination fee with any of our processing relationships. You really have nothing to lose and a whole lot to save by working with AdvoCharge! Please note the processing fees are assessed in arrears, so you will be responsible for any service you have already received, but not for any fees beyond the point of your cancellation with the processor. Some early AdvoCharge clients have unique fee-structure agreements with both the processor and AdvoCharge. Those clients remain bound by the terms of those agreements, but then as it is now, in no way is there ever an early termination or cancellation fee with the card processors. Do you have a contract term and cancellation fee? AdvoCharge ensures there is no set-up, annual or cancellation fee with the processing provider agreement we broker for you. We want you to be happy with your rates, service, and support; not shackled because you have a high cancellation fee that you can’t get out of. Some early AdvoCharge clients have a unique fee-structure agreement known as the Advocate Fee where AdvoCharge was compensated by a percentage of the savings we were able to generate with our low rates over the merchant’s previous card processing fees. Those clients remain bound by the terms of those agreements, but then as it is now, in no way is there ever an early termination or cancellation fee with the card processors. Signing up is simple and easy and takes approximately just 5 minutes. You will not need to print any documents because we have developed an intuitive online application with a virtual signature option. Just click the Start Saving button below. Complete some info on your business, upload a voided check for your deposit account as well as your current processing statement, and we’ll have you approved shortly. How long will it take me to fill out the online merchant account? Signing up is simple and easy and takes approximately 5 minutes. Just click the link below. Do I need to print the application and fax back? You will not need to print any documents because we have developed an intuitive online application with a virtual signature option. Generally, once an application is electronically signed, it takes a day to approve and then another 3-4 business days before the account is ready to accept payment. We offer some of the lowest rates in the industry, and as such the underwriting time can be a little longer than the large aggregators like Square, Stripe, and PayPal. But compare our rates to theirs and I’m sure you’ll see that the upfront wait will pay dividends many times over down the road. To be clear, please do not expect to have an approved and processing account within 24 hours. It will not work that fast. Do you offer next day funding? All merchant accounts are setup with next day funding at no additional charge. The next day funding cutoff is 9:30 PM EST. All funds settled after this time will be ready in your account after one additional day. What credit cards will I be able to accept with a merchant account from AdvoCharge? You will be able to accept all card types: Visa, MasterCard, Discover, and American Express. We can even accept the Chinese card, Union Pay. Additionally, for most businesses your American Express sales will qualify for next day funding and will appear on the same monthly processing statement. However, business that accept in excess of $1,000,000 in annual American Express sales will continue to be funded directly through American Express. Can I use a smartphone, tablet or my computer to accept credit card payments? Absolutely! All three come free of charge with every merchant account. If you need a plug in card swiper, we offer those at our wholesale rates direct from the processor. A business checking account is required for all business entities. If your business is established as a sole proprietor, you personal checking account is sufficient. My e-Commerce website isn’t ready; can I still qualify for an account? Do I need to provide a business license to obtain a merchant account? Underwriting requires a completed online application including federal tax ID and/or SS# plus a voided check, but not necessarily a business license. The voided check can simply be uploaded into our integrated application portal/center. Additionally, uploading a prior credit card processing statement is encouraged so that we can provide you with a post savings analysis after your first month of accepting credit card payments with AdvoCharge. Do I need to have an American Express® or Discover® account before I apply? We set you up for all card types, and there is no need to speak directly with American Express or Discover beforehand. Additionally, both card types qualify for next day funding. Do you offer currency conversion? Do you offer Level 2 and 3 processing? We sure do! Level 2 and 3 processing applies to those business that accept payment from other businesses. If you collect a little bit of additional information like invoice and tax rate, you can qualify for a special Interchange rate on those B2B transactions. Level 2 and 3 processing can save you significantly over what you had been paying to accept credit cards that were issued to other businesses. We can help ensure you are collecting the correct information to take advantage of these rates. Absolutely! You will have access to 24/7/365 technical and customer support through whichever processing partner we establish for you. The checking account you provide us with will be funded on a daily basis for all sales batched/settled the previous day. All weekend sales will fund on the following Monday. You may also choose to have one account that receives funds and another where the fees are removed. Some business like to separate deposits and withdrawals, and we are happy to accommodate. You will be able to access and download your monthly processing statement through our robust back office portal that comes free of charge with every merchant account. If you enjoy having a monthly statement mailed to your home or business, that service is also provided upon request. Are there any extra features that I will have access to with my merchant account? Every AdvoCharge merchant account includes free mobile processing, a virtual terminal that is accessible from any internet connection, and a comprehensive back office portal for monitoring all sales activity. What kinds of businesses does AdvoCharge accept as clients? AdvoCharge accepts merchant applications from all business types. A very small percentage of accounts may fall into a higher risk category. Should your specific business fall into this category, an AdvoCharge representative will reach out to you once we are notified by underwriting. Are there any prohibited businesses to whom you cannot offer processing? If you feel you have a legitimate business that could be misconstrued for one of the above listed business types, feel free to shoot us a note at save@advocharge.com. Be sure to explain your business and tell us your projected processing volume and average sale amount. The Cash Discount Program is most ideal for businesses with low ticket sales, since you are passing your merchant processing fees to your customer. If your business doesn’t fall into this category, we invite you to explore our standard merchant processing offerings. Is it legal to offer a Cash Discount? However any consumer who pays with cash, will have this fee waived. Your posted prices are your cash prices. Consumers who pay with a method other than cash will see a 4% cash discount fee listed on their receipt at the register. The additional 4% service charge is programmed into your terminal, hence there are no additional steps for you. Why don’t I just implement the program myself? If for any reason you wish to discontinue the Cash Discount Program, we will immediately change you back to traditional Interchange Pricing. You will still save a lot of money on your credit card fees by utilizing the AdvoCharge low rate program, which saves business owners on average 72% over the fees your previous processor was charging. You said a 20% savings, but what I’m seeing is less. What gives? The underlying cost of processing is called Interchange and the card networks (Visa, MasterCard, Discover, American Express, etc) control those fees. 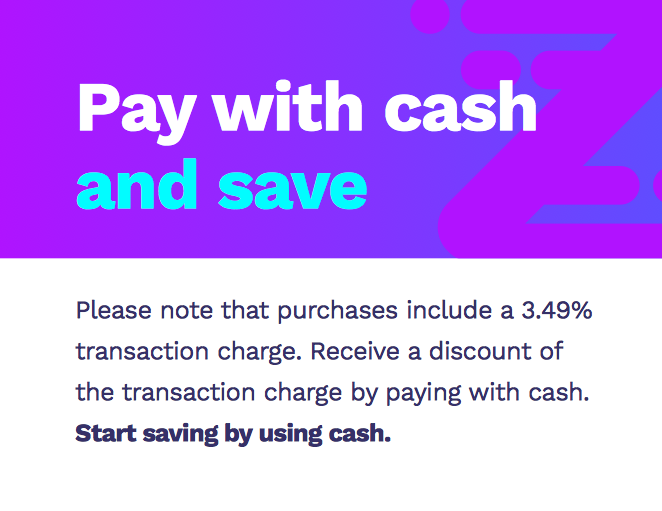 Everyone who accepts payment by credit card has to abide by those fees if they are going to access the card networks and that’s way Interchange is often referred to as “true cost” or the “baseline cost” of accepting credit cards. However, it is the fees above Interchange that processors and processing providers can control. AdvoCharge works for you to reduce those fees above Interchange by 20%. So if you have total fees of $1000 per month, you can’t expect to have your total fees to be reduced by $200, but you will see the fees above Interchange reduced by 20%. How can you guarantee a 20% reduction in my current processing fees? I’m pretty sure I have a great rate. You very well might have a great rate, but AdvoCharge has a long history of working with our processors. Through our network, our large clientbase, and our negotiations we have always been able to improve on the rates of our new clients. We haven’t been beat yet, so you have nothing to lose and 20% savings to gain!